Would have rated higher except for our restaurant experience we waited ages to be seated, and staff just kept walking past without saying anything but once we were seated the trainee was very good. did not provide the room that was purchased.. AC didn’t work. Nightmare of a place - as usual and I’m a member. It’s a shame because there is allot of potential. Excellent Customer Service. I enjoy my stay always and the versatility that comes with my arrival/ departure procedures. If you've ever scanned your friends' social media and thought your life was dull, get some payback with a stay in East Perth. Situated 2 kilometres from the centre of Perth, it's a great place to base yourself while discovering Western Australia's capital. There's no lack of things to see and do in Perth. Drop by its iconic sights, Swan Bells Belltower and Kings Park and Botanic Garden, and take some seriously envy-inducing snaps. The Perth Mint and Hyde Park are in and around East Perth. These popular tourist attractions really ought to be on your agenda. Too worn out to travel miles away? Looking for a place to stay near Swan Bells Belltower? Easy. 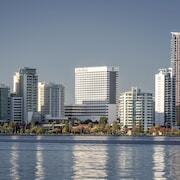 Suss out The Richardson Hotel & Spa, Quest South Perth, The Terrace Hotel, Duxton Hotel Perth and Mantra on Hay. 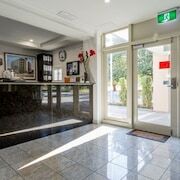 You'll be able to stay near the Perth Mint at a number of hotels, including the Fraser Suites Perth, Mounts Bay Waters Apartment Hotel, Hyatt Regency Perth, Assured Waterside Apartments and Adina Apartment Hotel Perth - Barrack Plaza. 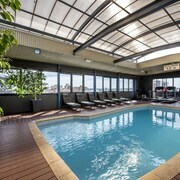 Visit Crown Perth, where travellers can enjoy a memorable stay. When you're done exploring, bunk down at a comfy hotel nearby. 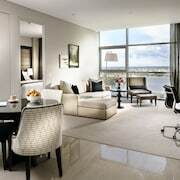 The Crown Metropol Perth and Assured Ascot Quays Apartment are worth looking into. You needn't be a bettor to appreciate the animated horse racing atmosphere at Belmont Racecourse. 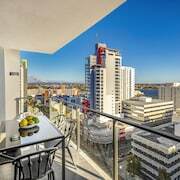 You'll also find great hotels within easy reach of this sight, such as the Novotel Perth Langley and All Suites Perth - Managed by 8Hotels. You won't have to battle with lumpy mattresses and mysterious scratches from the walls when you lock in a bargain room at the Wombat Backpackers and Hay Street Traveller's Inn - Hostel. Here at lastminute.com.au, cheap doesn't mean nasty. What are getaways for if not splashing out? 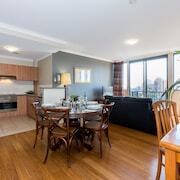 The Regal Apartments and Baileys Serviced Apartments are lastminute.com.au's recommended options for those travellers who don't mind throwing down a little extra cash. Why not grab your mates and arrange night one of your break over a hot coffee at Protein Patisserie? It's not far away, and there's plenty of sweet treats to keep you going. When you start craving something more filling later, follow your nose to Co-Op Dining. Their mouthwatering menu is bound to satisfy your grumbly tummy. You could stop there, but you're on holiday, right? Either way, there's a wine with your name on it at Antico Caffe! 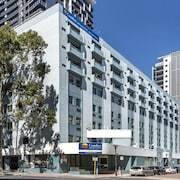 Having trouble securing the best East Perth hotel room? Don't get your knickers in a knot — there are stacks of options in Perth and St George's Terrace. So, what else do you need to know? Whether you're looking for a cheeky couple of days away with bae or a nonstop spiritual odyssey, we're here to turn your daydreams into reality.